The use of the word “genius” conjures up ideas of magic or at least rare and only accessible to a minority. But this is not the case for the Zone of Genius. This concept is accessible to all, there are only two conditions: you have some self-awareness and you have the will to operate in your zone of genius. First things first, what is the Zone of Genius? The idea was developed by the American psychologist Gay Hendricks in his book “The Big Leap” where he addresses it from a personal as well as a professional perspective. 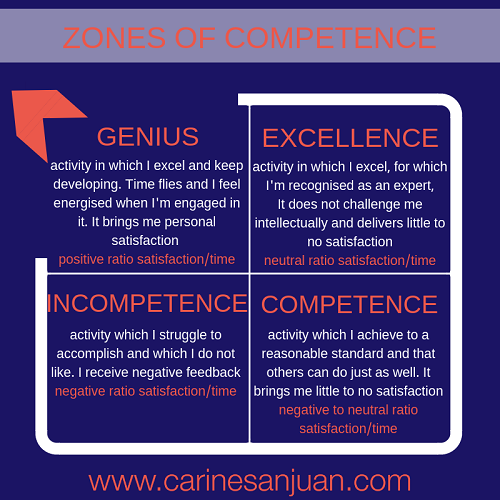 In it, he describes four “zones of competence” that will sound familiar to most people: The zone of incompetence, the zone of competence, the zone of excellence and the zone of genius. He talks about the Zone of Genius as where we realise our full potential. We develop and deepen our skills (hard and soft) because we are in full possession of our talents and are aware of our challenges (whether we decide to deal with them or not). We choose to be in constant “learning mode” and to be so with enthusiasm and curiosity. This posture impacts how we interact with others, they are allies with whom we can build relationships and move forward. One might think that leaders and people who “succeed” in their professional careers are those who spend most of their time in their Zone of Genius. However Hendricks notices that, on the contrary, the majority of leaders remain stuck in their Zone of Excellence. Ouch! I first discounted this hypothesis and then analysed my career and development more closely … well, let’s just say I invite you to also do this exercice. Observe your current behaviour and question your colleagues – peers, team members and managers. You will be surprised at the results. So why don’t we all move from our Zone of Excellence to our Zone of Genius? That is a whole article in itself but to make it simple: FEAR. The fear of failing, of being judged (who do you think you are? ), of disappointing, of being envied, of being overwhelmed by the situation, of having extra work … feel free to add yours to the list! Day after day my actions reaffirm my talents and this in turn nourishes my self-esteem and, as a result, my confidence. Being more confident I’m more willing to explore and develop new skills that reinforce my ability to work from my zone of genius.This is a virtuous circle. I develop myself not to compensate for my lack but to increase my talents, an important mindset shift in my approach to learning. To access my zone of genius I need a degree of self-awareness and also I need to accept myself as I am. In that process I take better care of myself and develop an essential physical and mental well-being. It’s only from such a perspective that I can eliminate actions that are outside my ZoG and that are often energy intensive and time-consuming. As a result I feel more balanced. When I operate from my ZoG I gain a greater clarity about my talents, my challenges, my values ​​and my objectives. This allows me to make fully (and I mean FULLY) informed choices. Therefore I feel more confident in my decisions and I am able to reach those decisions faster. Zone of genius and creativity are intrinsically linked. Hendricks argues in several of his books that creativity is an important need and that we must ensure we meet that need. To operate from our ZoG you need your creativity and when you operate from your zone of genius you are connected to your creativity, they feed from one another. we are all role models, therefore, the impact in an organization of an individual who operates in his ZoG is immense: talent, curiosity, integrity, desire to learn, energy, etc. What’s also key is that when I am in my ZoG I allow others to rise up into their ZoG. As a manager or leader it’s in my interest! If I want to spend more time in my ZoG and give the best of myself it is a lot easier if my colleagues do the same. When I am in my Zone of Genius I rise above the mere ego-led competition and I want to collaborate and construct for the best possible result. By focusing primarily on aspects of my role where I excel and that energizes me brings satisfaction. There is also a more subtle and crucial satisfaction (according to our friend Maslow! ): self-realisation on a daily basis! Being pragmatic when I see these benefits they make me reconsider my fears; it’s worth a shot, I thought. Decision making is infinitely easier. I’ve been able to easily let go of a role which is clearly in my zone of excellence: I do a great job and I receive social recognition for it but it saps my energy and takes up a good chunk of time. I had been trying to do this for over a year but the social recognition feeding my ego made it difficult to let it go until I understood the difference between excellence and genius! 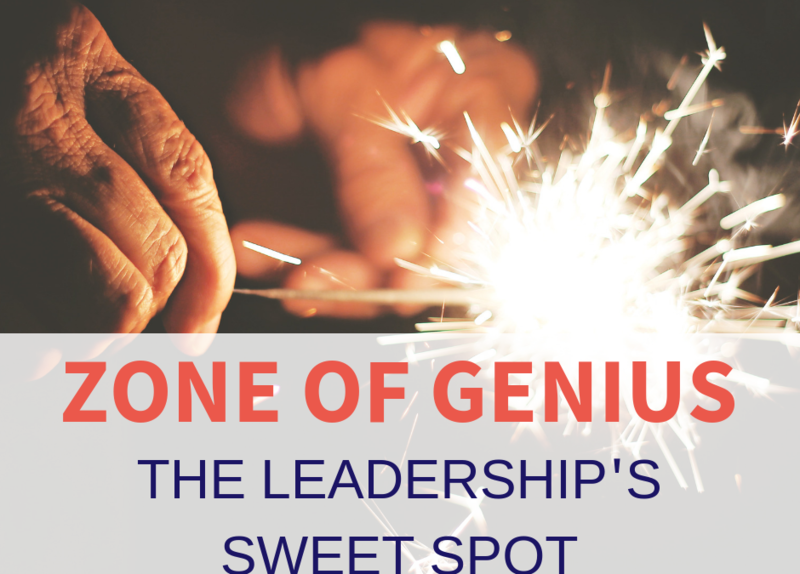 In short enabling others to be in Zone of Genius gives you a high, or maybe I need to get out more! And you don’t need a team to experience it. Nowadays I’m an independent consultant but I can still “hold the space” for my colleagues, generally other coaches, to rise up to their zone of genius. I am very lucky to get to experience working in co-development and using collective intelligence and it lands itself brilliantly to it. I no longer waste time doing and re-doing activities for which I am not particularly competent and/or I do not like so I can spend more time on activities with high ratio satisfaction / time. And let’s be honest, in my line of work these tend to also be more lucrative. Let me share a personal experience to illustrate this point. A couple of years ago my daughter was diagnosed with a health issue which forced me to change my cooking habits. After a couple of weeks, I realised that I was always in a bad mood about cooking, I lacked ideas, my output was not great and I was full of guilt/excuses about all this. In summary, my satisfaction/time ratio was off the scale negative. Once I applied the “zones of competence” principles it was quite clear I was in a zone of incompetence BUT I couldn’t just drop this task. However, the realisation enabled me to take a constructive approach: to seek support, to involve my daughter (who is very creative in the kitchen!) and… to accept my incompetence in cooking and that it doesn’t impact my ability as a mother. The idea of the ZoG is not a fancy justification to get rid of the stuff you don’t like doing. The idea is to do “better” or differently to free yourself to UPLEVEL. And that for your benefit and for that of your organisation. This is an opportunity to rethink the way your team works for the “better”: doing better, learning better, being better, deciding better, sharing better… so you can ALL uplevel. Even if your colleagues don’t welcome the idea at first, I still invite you to assess what is possible and to put it into place. Your mindset and your impact will be radically different and there is nothing more convincing than a concrete example. With the Zone of Genius, everything begins with a desire, a willingness to UPLEVEL your role and career. Will you step up to your zone of genius?